Public in the Phoenix area invited to enjoy beer and cheese pairings, cake tasting, dance lessons, hair and makeup trends, special financing and more. It's been a great year serving up love in the Valley. Robbins Brothers, The Engagement Ring Store and a proud partner of the Phoenix Suns, is commemorating one year of bling and bliss with a three-day soiree from Friday, May 13 to Sunday, May 15. Single gals, beaus and starry-eyed couples are invited to an open-house style party complete with craft beer and cheese pairings, cake tasting, dance lessons, hair and makeup trends, a ring selfie station and more. Friday: Between 5 - 7 p.m., guests can partake in craft beer and cheese pairings as well as learn the hottest makeup trends from the pros at The Sparkle Bar. Looking to plan your future wedding? Learn everything you need to know from the experts at KDP Events. Guests can also start arranging flowers for their dream wedding with Blooming Expressions Flowers. Saturday: The morning kicks off at 11 a.m. with makeup tips and tricks by the artists at The Sparkle Bar. Think you have two left feet? Guests can work on their dance skills with lessons by Take the Floor Dance Studio from 2:30 - 4:30 p.m. From 11 a.m. - 7 p.m., learn everything you need to know about planning a wedding from KDP Events and Blooming Expressions Flowers. Sunday: Take the Floor Dance Studio will prepare you for your first dance with lessons from 11 a.m. - 2 p.m. Guests can also learn from wedding planning and floral experts, KDP Events and Blooming Expressions Flowers from 12 p.m. - 5 p.m. Patrons who make a purchase during the anniversary weekend will receive exclusive financing. Guests will also have a chance to win special giveaways including a Phoenix Suns swag bag filled with an autographed item and authentic apparel, a surprise engagement photo shoot with Paparazzi Proposals, and more. To RSVP for the open house soiree, visit Eventbrite. To reserve a one-on-one appointment with an engagement ring expert, please call 480.787.2323 or email fanclub(at)robbinsbrothers(dot)com. 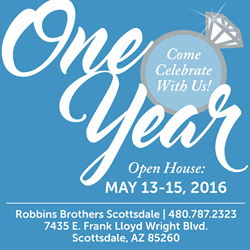 Robbins Brothers is located at 7435 E Frank Lloyd Wright Blvd in Scottsdale. For more information, please call 480.787.2323. An engagement and wedding ring retail company with freestanding stores located in Scottsdale Arizona, Southern California, Houston and Dallas/Ft. Worth Texas and Seattle, Washington. Robbins Brothers serves as the destination for couples in love. While the company specializes in engagement ring settings and loose diamonds, it carries an extensive selection of wedding bands, promise rings, anniversary bands, three-stone rings, earrings, pendants and bracelets. The company features designers including Tacori, Simon G., Verragio, Michael M and Henri Daussi; as well as proprietary brands such as Cherish and Candlelight. Onsite jewelers are available to set diamonds, create custom-settings and perform service and maintenance checks. Each location is furnished with a refreshment lounge, relaxation area and television. Visit http://www.RobbinsBrothers.com to learn more.